This weekend was another exciting one for 13 of the 18 minority head coaches in the Football Bowl Subdivision (FBS). 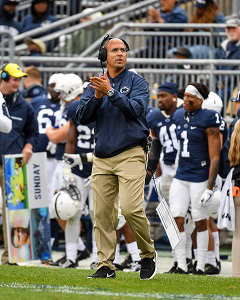 In the game of the week Penn State and head coach James Franklin lost in a close game to Ohio State, currently ranked 3rd, 27 – 26. The loss dropped Penn State two spots in the Associated Press (A.P.) rankings to 11th. Stanford and head coach David Shaw are now ranked 14th after losing to Notre Dame, now ranked 6th. Brigham Young and head coach Kalani Sitake are now out of the A.P. Top 25 after losing to 10th ranked University of Washington 35 – 7. The game of the week features Vanderbilt and head coach Derek Mason taking on the number two team in the country when they play the University of Georgia in Athens. A.P. 11 -James Franklin (4-1) and Penn State will look to bounce back against a very good Michigan State team who is ranked 20th. This will be a must win game for Penn State if they are going to maintain the chances of getting into the College Football Playoffs. Lovie Smith (2-2) and Illinois didn’t have a game in Week 5. This week they face Rutgers who is 0 – 4 this season. A.P. 14 – David Shaw (4-1) and Stanford will look to get back on track this week after losing to Notre Dame. They take on the University of Utah at home in Palo Alto. Herman Edwards (3-2) and Arizona State lost won against Oregon State 52 – 24. This week they take on a tough University of Colorado team that is ranked 21st and 4 – 0. A.P. 18 – Mario Cristobal (4 -1) and Oregon had an impressive win against then ranked 24th California Berkeley. This week they are off as they prepare to play 10th ranked Washington on October 13th. Kevin Sumlin (2-3) and Arizona lost to the University of Southern California 24 – 20. They will play at home this weekend against California Berkeley. Dino Babers (4-1) and Syracuse lost a close game to 4th ranked Clemson 27 – 23. This week they travel to Pittsburgh to play the 2 – 3 University of Pittsburgh. Wille Taggart (3-2) and Florida State won on the road against Louisville. This week will be harder as they take on the 17th ranked Miami Hurricanes in Miami. Derek Mason (3-2) and Vanderbilt won against Tennessee State 31 – 27. This week they face one of the best teams in the country when they play 2nd ranked Georgia in Athens. Jay Norvell (3-2) and the University of Nevada in Reno won against the Air Force Academy 28 – 25. This week they play Fresno State at home. Anthony Sanchez (2-2) and the University of Nevada Las Vegas were off this weekend. This week they play the University of New Mexico in Las Vegas. Charlie Strong (4-0) and South Florida were off this weekend. They play on the road this week against the University of Massachusetts. Scottie Montgomery (2-2) and East Carolina beat Old Dominion University 37 – 25. This week they travel to Philadelphia to play Temple. Ken Niumatalolo (2-2) and Navy were off last weekend. This week they play the Air Force Academy in Colorado Springs. Mike Jinks (1-4) and Bowling Green State lost to Georgia Tech 63 – 17. They play at home this week against Toledo. Frank Wilson (2-3) and Texas San Antonio won against the University of Texas El Paso 30 – 21. They play at home this week against Rice. Everett Withers (1-3) and Texas State were off last weekend. This week they play Louisiana, Lafayette. Kalani Sitake (3-1) and Brigham Young University got knocked out of the A.P. Top 25 when they lost Washington who is currently ranked 10th. This week they play Utah State at home. Frank J. Matthews can be reached at frankj@diverseeducation.com.